Propane Torch Flame Adjusting Valve, 1/4 in. 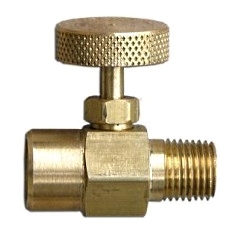 DESCRIPTION: An all brass, heavy-duty needle valve incorporating a thumb wheel for easy open or close. Standard right hand NPT Threads. Tested in excess of 350 lbs. Replacement valve for Flame Engineering and other popular propane torches.